A Senegalese doctor who publicly declared the president to be too ill to govern has been given a one-year suspended jail sentence. Mame Mary Faye was also fined 500,000 CFA francs ($1,000; £600). Dr Faye, a former governing party activist, was found guilty by a court in Dakar of spreading false news that was likely to disturb public order. 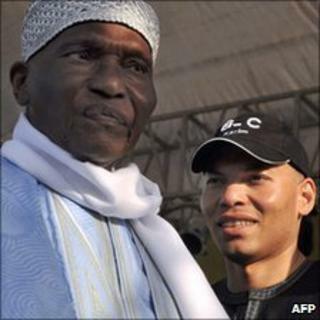 President Abdoulaye Wade, 84, says his health is fine. It is not clear if he will seek re-election in 2012. Dr Faye's lawyer told the AFP news agency she would appeal against the conviction. The eye specialist told journalists last month: "I declare that in 2010, as a result of illness, President Abdoulaye Wade is already unable to continue to assure the proper office of the president of the Republic of Senegal." And in 2012, he would be "medically completely unable to assume the office of president", she added. Opposition parties have said Mr Wade is not allowed to seek a third presidential term in 2012. There is also widespread speculation that his son, Karim, may try to succeed him. He is already a minister.